Will You Stand Up For System Change? The New York State Board of Elections posted the certified election results on December 14, 2018 after counting all the absentee and other paper ballots and canvassing the voting machines. You can see the county and statewide results here. Our final vote total was 103,946. In 2014, we received 184,419 votes. The biggest drop offs were liberal college areas (St. Lawrence, Tompkins, Ulster counties), where Cuomo seems to have got the anti-Trump Democratic vote, and the capital district, where public employees had given us the most votes in 2010. Our smallest drop-off upstate was in the Buffalo area, where local Greens organized several good events and we received the Buffalo Teachers Federation endorsement. Our drop-off was also much smaller in Orange County, home to our Attorney General candidate, Michael Sussman. In the New York City area, we almost maintained our 2010 vote in Brooklyn and actually got slightly higher votes in the Bronx and Queens. The rest of the metro area declined roughly proportionately with our overall decline. Congratulations to all of us for achieving our baseline goal in this election – retaining the Green Party ballot line statewide for the next four years. Thank you to all of you who leafleted, phone banked, text banked, organized events, donated, and voted for the cause. We live to fight another day. Between the collapse of the climate and the living standards of working-class New York, we have to keep fighting. Green Party gubernatorial candidate Howie Hawkins is billing himself as "Plan B" for New Yorkers who didn't vote for Gov. Andrew M. Cuomo in last month's Democratic primary. 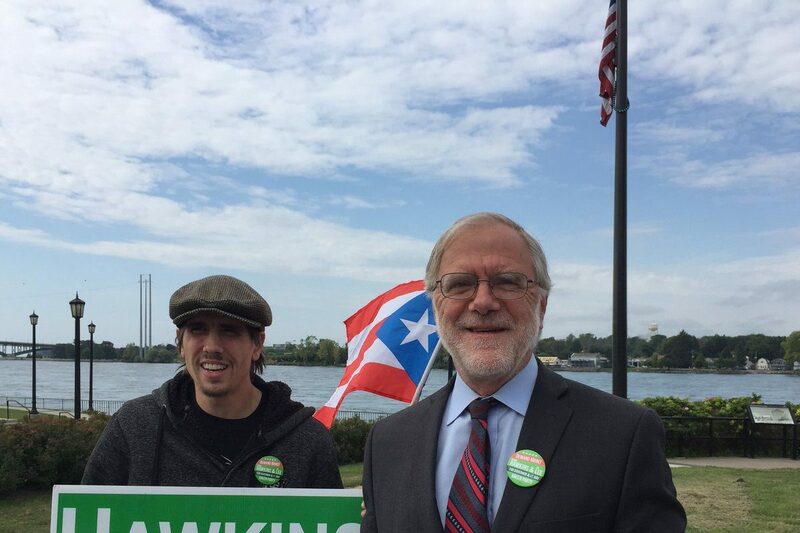 Hawkins, who garnered about 5 percent of the vote in finishing third in the 2014 gubernatorial election won by Cuomo, made that his overriding message Thursday as he kicked off his general election campaign at Broderick Park in Buffalo. "We had half a million people vote for the progressive Democrats" in the primary, Hawkins said, "and I'm here to tell them that I'm Plan B when we get to the general election for those progressive voters. And also to appeal to those progressives who according to public opinion polls think Cuomo's a liberal ... no, look at the platforms. I should be your vote."